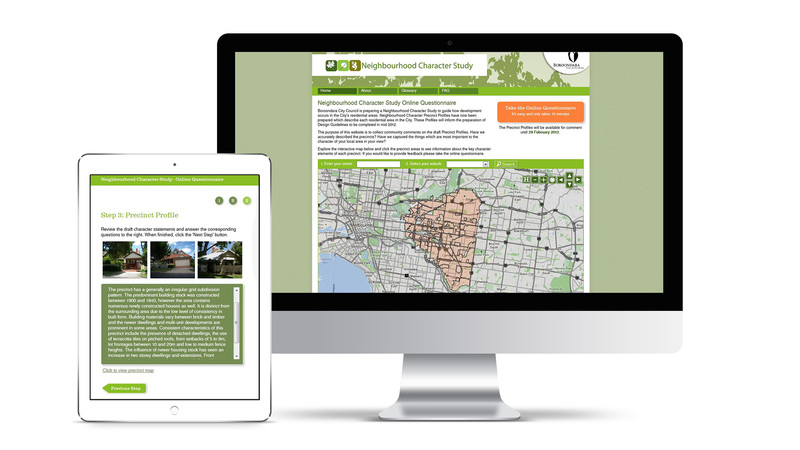 Harvest worked with David Lock Associates and Collaborations to develop a spatially-based, online consultation tool to assist with the preparation of a Neighbourhood Character Study for the City of Boroondara. The tool was used to gather community input and facilitate the development of a series of Character Statements and Design Guidelines. Harvest also provided GIS and mapping support for the project. The tool was used on two separate occasions during the planning process as a way to get focused and helpful community feedback. This has allowed Council to create greater buy-in from the local community on a highly significant project for the municipality. The website also helped communicate the purpose and timelines of the project, while making participation more convenient and interesting.